Today marks the 10th anniversary of joining Second Life. I thought about trying to update my avatar, in game, maybe with one of the new mesh avatars, but didn’t. My avatar in Second Life hasn’t changed in 3 years, mostly because I haven’t played much in 3 years. I basically log in at least once a year, sell $72 worth of linden dollars to pay for my premium account for another year, and that’s about it. When I logged in three days ago, my beautiful river view was trashed with someones scripted garbage. I submitted a ticket and when I logged in today, the garbage is still there. The last time something like this happened, it took months to resolve. Yes, I have been in SL long enough to have experienced every kind of griefing there is. Another reason my Second Life avatar has not changed is because I spend a lot more time playing with my Poser avatar. It’s a bit more expensive hobby than Second Life, but the resulting screenshots are much more interesting. I just finished updating the “Live Cabaret” pictures in the update. If you want to follow the updating process, I am posting stuff at arianeb.tumblr.com. For me Second Life got replaced by Guild Wars 2. For years my moods have drifted between, being creative and having fun. Second Life was sort of the bridge between the two as I could do both, and be social with other players. Between being creative in Poser and having fun in Guild Wars 2, and the social side of GW2, Second Life got squeezed out of the cycle. 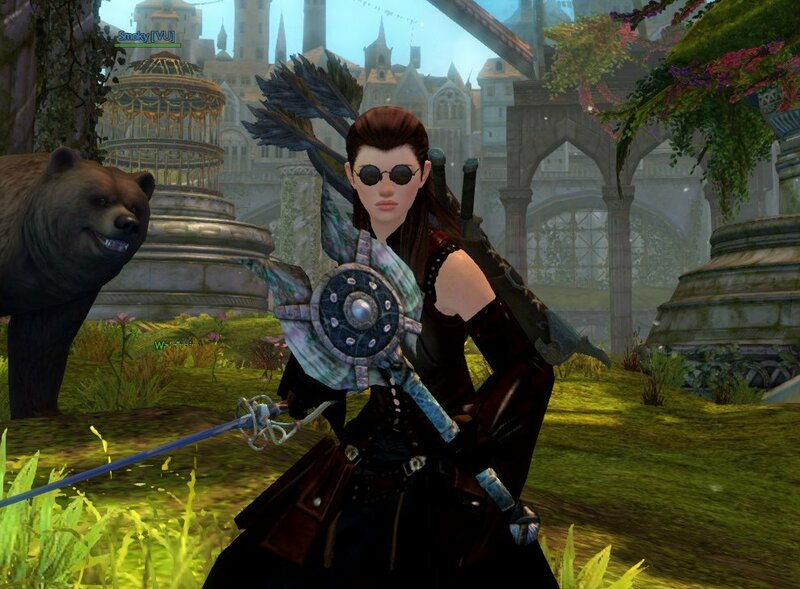 I bring up Guild Wars 2 because the recent upgrade has drastically improved the game for me and most other players. The most talked about changes was the way outfits work, which among other things allows me to wear sunglasses in combat. But the biggest game changing update was something they call “Megaservers”. You know how when most MMORPGs start to decline they start combining smaller servers together causing a lot of grief? GW2 has reengineered the process which results in a lot more players in any given zone at any given time. Having lots of players in a zone is a lot more fun than having just a few (I often found myself the sole player in certain zones). Every zone has group events that require multiple players to do. If you are by yourself, they don’t get done. Now Megaservers dramatically improve traffic enough that these events can be done again. Speaking of group events, they actually made a schedule of major boss fight events in the game. Every 15 minutes there’s a new Boss fight, and if you want to follow the schedule, you can go from boss fight to boss fight, for a chance at a big reward at the end of each event. Between “Megaservers” and World Boss schedules, Guild Wars 2 is once again a social game, and still one of the best MMORPGs out there. I recently made some sojourns into other virtual worlds like Nuvera Online and There.com. Didn’t stay long enough for a full scouting report, but I may go visit these and other small yet persevering worlds soon and file a report. Nice work! The fantasy illo is great! I don’ t have any experience in the virtual worl, the real world is huge … Here in Berlin, the internet connection is lousy, although the hotel promised us high quality wi-fi… About Poser, I had previous versions, but never managed to create a decent image. Bryce was good, though, but not for human figures. But probably I will try these programs again when my long trip is over. Tomorrow, London again. I’m very interested in what you have to say about the other worlds. My biggest issue with 3DW is that there often aren’t enough people to interact with, but I don’t always want to engage in battle. I’ve yet to find something that fills that void.